HALIFAX -- A former senior Nova Scotia Mountie has been convicted of stealing 10 kilograms of cocaine from an exhibit locker. 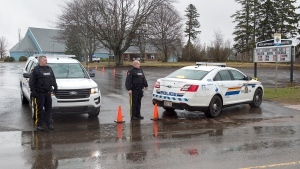 Craig Robert Burnett -- the one-time commander of an RCMP National Port Enforcement Team -- stole the drug from the force's Nova Scotia headquarters in 2010 or 2011, and replaced it with another substance. "I find this to have been a lonely period in Mr. Burnett's life ... Mr. Burnett felt 'betrayed' by his former spouse. I accept that when Mr. Burnett did not have his children and was not working, he sought solace in playing poker at the casino," said the judge.